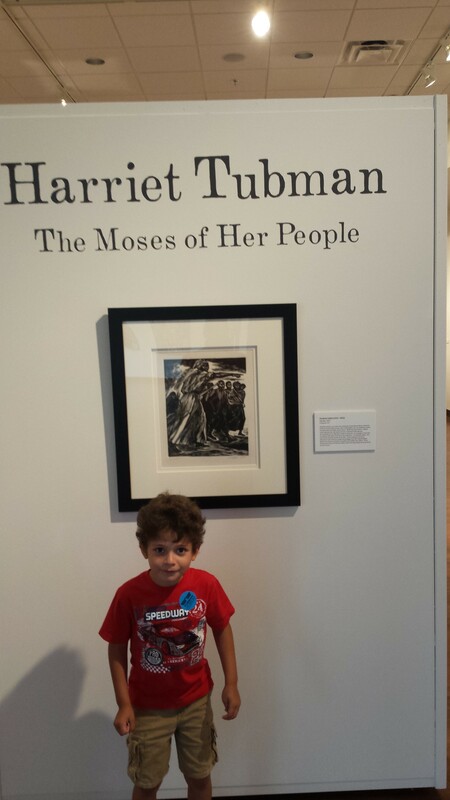 Macon’s Tubman Museum’s new location had only been open a few weeks when we visited. It was so new, in fact, that our car’s GPS system directed us first to the old location on Walnut. After seeing that location, we were even more impressed with the block-long bright yellow building that greeted us in the new location on Cherry Street. Visitors enter the new building onto a blue and yellow tiled floor beneath the rotunda. 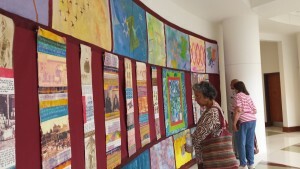 It’s two stories with several classrooms around the first floor along with two small galleries and a unique exhibit of the history of Macon depicted on quilts, by textile artist, Wini McQueen in her comprehensive series commissioned by the museum, The History of the Dream, displayed on the walls beneath the rotunda. 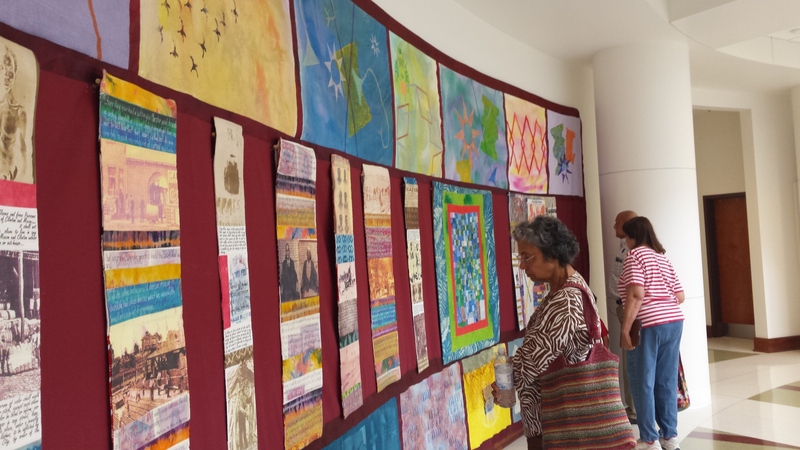 Some of the quilts include text from the WPA’s slave narratives, photographs, and other documents. 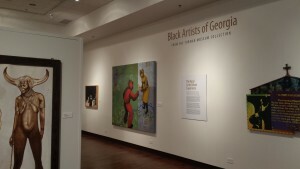 In the ground floor galleries is a “Black Artists of Georgia” exhibit. One painting that stood out to us was by artist, Kojo Griffin and depicts human bodies with animal heads possibly engaged in a domestic dispute. His work is fun because it leaves so much to interpretation. After fully exploring the ground floor of the museum, we opted to break for lunch, especially since the youngest member of our party, five-year-old, Kyler, had expressed a desire to eat. One of the friendly employees gave us a map of downtown Macon and offered a few recommendations. We ended up at Market City Cafe, where the really standout item was the delicious fried string beans. The four adults devoured two full orders. (Kyler wasn’t interested.) The sweet tea wasn’t half bad, and nobody complained about the red velvet cake either. 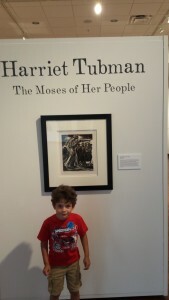 The second floor of the museum included the Harriet Tubman gallery, full of diverse artwork depicting Tubman and artifacts from her life including photographs and letters. The first piece we saw was Harriet by Elizabeth Catlett, whose art I’d seen at the MoAD exhibit in February. I was looking for the Black Moses Barbie video to be shown somewhere, but alas, it was nowhere to be found. There were the familiar photos of the icon and some lesser-known images. One of Tubman near the end of her life, sitting in a chair outside wearing white and wrapped in a white blanket stood out to me since it was the most recent. Another section of this gallery featured what was called in the original location the “inventors gallery,” a number of samples of artifacts invented by African-Americans. One that was new to me was the pencil sharpener, invented by John Lee Love and patented in 1897. 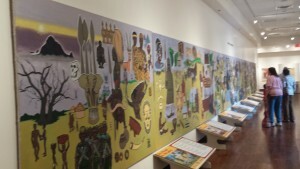 Then, a piece that was featured in the previous space is the huge mural intended to depict African-American history from ancient times to the present was painted by a Macon artist, Wilfred Stroud. It is dominated by portraits of African-American celebrities. We culminated our visit with a stop in the museum store followed by a viewing of the short film, A Slave’s Story: Running a Thousand Miles to Freedom, based on a true story about William and Ellen Craft, a married couple who escaped slavery in Macon by disguising Ellen as a White man and her husband as his slave. I’d heard of their story and was glad to see the film. I am constantly struck by the number of captivating and dramatic stories that exist as part of the African-American story. Check back next Monday to read about our visit to the Sixteenth Street Baptist Church in Birmingham, Alabama.